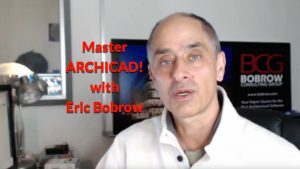 Many interesting topics are covered, including the creation of worksheets, importing DWG files, setting up Virtual Trace for the plan and elevations to show the corresponding 2D drawings in proper alignment to the model, and some complex manipulations of ArchiCAD library doors and windows to match the original design drawings. This entire process was done in 90 minutes! This 44 minute video is condensed from the original recording made in "real time" that shows every step along the way. This excerpted version leaves out some less essential details as well as much of the repetitive drawing and data entry. To be frank, the first time I did this it took between 3 and 4 hours, because I had to become familiar with the project and how the DWGs were organized. The second time it took about 2 to 2 1/2 hours, and then I started over and recorded the process the third time in 90 minutes from start to finish.